For the nursing professor, see Richard Garfield (nursing professor). Richard Channing Garfield (born June 26, 1963) is an American mathematician, inventor, and game designer. Garfield created Magic: The Gathering, which is considered to be the first modern collectible card game (CCG). Magic debuted in 1993 and its success spawned many imitations. Garfield oversaw the successful growth of Magic and followed it with other game designs. Included in these are Netrunner, BattleTech(CCG), Vampire: The Eternal Struggle, Star Wars Trading Card Game, The Great Dalmuti, Artifact, and the board game RoboRally. He also created a variation of the card game Hearts called Complex Hearts. Garfield first became passionate about games when he played the roleplaying game Dungeons & Dragons, so he designed Magic decks to be customizable like roleplaying characters. Garfield and Magic are both in the Adventure Gaming Hall of Fame. Garfield was born in Philadelphia and spent his childhood in many locations throughout the world as a result of his father's work in architecture. His family eventually settled in Oregon when he was twelve. Garfield is the great-great-grandson of U.S. President James A. Garfield and his grand-uncle invented the paper clip. He is also the nephew of Fay Jones, who, already an established artist, illustrated one Magic card for him. While Garfield always had an interest in puzzles and games, his passion was kick-started when he was introduced to Dungeons & Dragons. Garfield designed his first game when he was 13. In 1985, Garfield received a Bachelor of Science degree in computer mathematics. After college, he joined Bell Laboratories, but soon after decided to continue his education and attended the University of Pennsylvania, studying combinatorial mathematics for his PhD. While searching for a publisher for RoboRally, which he designed in 1985, Wizards of the Coast began talking to Garfield through Mike Davis, but the game looked too expensive for a new company like Wizards to produce. :278 Peter Adkison of Wizards of the Coast expressed interest in a fast-playing game with minimal equipment, something that would be popular at a game convention. Adkison asked Garfield to develop a game that was cheaper to produce than RoboRally, that might be more portable and even easy to carry around to conventions; Garfield did have an idea about combining baseball cards with a card game and began turning that rough idea into a complete game over the next week. :278 Garfield built on older prototypes of games that dated back to at least 1982, when he had created a Cosmic Encounter-inspired card game called "Five Magics. ":278 Garfield thus combined ideas from two previous games to invent the first trading card game, Magic: The Gathering. At first, Garfield and Adkison called the game "Manaclash," and worked on it in secret during Palladium's lawsuit against Wizards, protecting the game's intellectual property under a shell company called Garfield Games. :278 Garfield began designing Magic as a Penn graduate student. Garfield's playtesters were mostly fellow Penn students. Garfield studied under Herbert Wilf and earned a Ph.D. in combinatorial mathematics from Penn in 1993. His thesis was On the Residue Classes of Combinatorial Families of Numbers. Shortly thereafter, he became a professor of mathematics at Whitman College in Walla Walla, Washington. Magic: The Gathering launched in 1993. Playtesters began independently developing expansion packs, which were then passed to Garfield for his final edit. In June 1994, Garfield left academia to join Wizards of the Coast as a full-time game designer . Garfield managed the hit game wisely, balancing player experience with business needs and allowing other designers to contribute creatively to the game. With his direction, Wizards established a robust tournament system for Magic, something that was new to hobby gaming. In 1999, Garfield was inducted into the Adventure Gaming Hall of Fame alongside Magic. He was a primary play tester for the Dungeons & Dragons 3rd edition bookset, released by Wizards in 2000. He eventually left Wizards to become an independent game designer. He still sporadically contributes to Magic: The Gathering. More recently, he has created the board games Pecking Order (2006) and Rocketville (2006). The latter was published by Avalon Hill, a subsidiary of Wizards of the Coast. He has shifted more of his attention to video games, having worked on the design and development of Schizoid and Spectromancer as part of Three Donkeys LLC. He has been a game designer and consultant for companies including Electronic Arts and Microsoft. Garfield taught a class titled "The Characteristics of Games" at the University of Washington. It is now taught as part of the University of Washington's Certificate in Game Design. ^ "Magic: The Gathering Fact Sheet" (PDF). Wizards of the Coast. 2009. Retrieved June 10, 2013. ^ a b c Varney, Allen. "Richard Garfield." The Escapist. 10 JULY 2007. Retrieved 27 June 2013. ^ "Complex Hearts". Math.unl.edu. Archived from the original on 8 July 2013. Retrieved 23 June 2013. ^ a b c d e f g Vasel, Tom (2005-06-19). 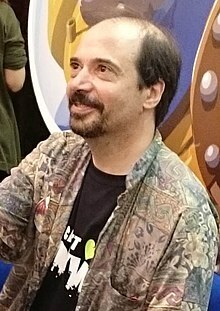 "Interviews by an Optimist # 49 - Richard Garfield". Archived from the original on 2007-08-14. ^ a b c Garfield, Richard (March 12, 2013). "The Creation of Magic: the Gathering". Wizards of the Coast. Retrieved 22 June 2013. ^ a b List of Winners, Origins Game Fair. Retrieved 22 June 2013. ^ Varney, Allen (December 1997). Dragon Magazine #242 (PDF). p. 120. ^ Rosewater, Mark. "Blogatog: Stasis". ^ Zurcher, Christopher (1998-12-27). "Just like magic". PolkOnline. Archived from the original on 2009-07-15. ^ a b c d e f g h i Shannon Appelcline (2011). Designers & Dragons. Mongoose Publishing. ISBN 978-1-907702-58-7. ^ a b Elias, Skaff (2002-03-08). "Legendary Difficulties". Latest Developments. ^ a b c Garfield, Richard (2007). "Dungeons & Dragons". In Lowder, James (ed.). Hobby Games: The 100 Best. Green Ronin Publishing. pp. 86–89. ISBN 978-1-932442-96-0. ^ Rosewater, Mark (2005-09-05). "City Planning, Part I". Making Magic. Retrieved 2007-04-27. ^ Rosewater, Mark (2011-09-05). "C'mon Innistrad, Part I". Making Magic. Retrieved 2011-12-16. ^ "Pecking Order". BoardGameGeek. Retrieved 2007-05-06. ^ "AVALON HILL WELCOMES BACK RICHARD GARFIELD; Rocketville Set to Blast-Off on March 10". 2006-02-07. Archived from the original on 2007-11-07. "Immer für eine Überraschung gut: Richard Garfield: Der Mann hinter Magic" (PDF). Amigo Spiele (in German). 2004-01-30.